We love going out to restaurants. When Joanna was still car-seat bound, it was pretty easy to get her in and out of a restaurant with relatively little stress. 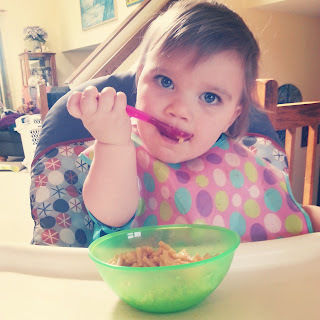 When she started sitting in a high chair, we could keep her entertained with cheerios. Now that she's a strong, independent woman, keeping her entertained and happy requires a bit of creativity. And with that said, I now say thank you, Nuby. I am excited to talk about Nuby's Mealtime Travel Set. It includes 4 forks, 4 spoons, and a spiffy carrying case. Joanna loves playing with spoons, rattles, and boxes - this combines all 3. It's dish washer safe (top rack), fits easily in the diaper bag, and looks kind of like a popsicle. Win win win. This set is available for $6 on Buy Baby Direct. 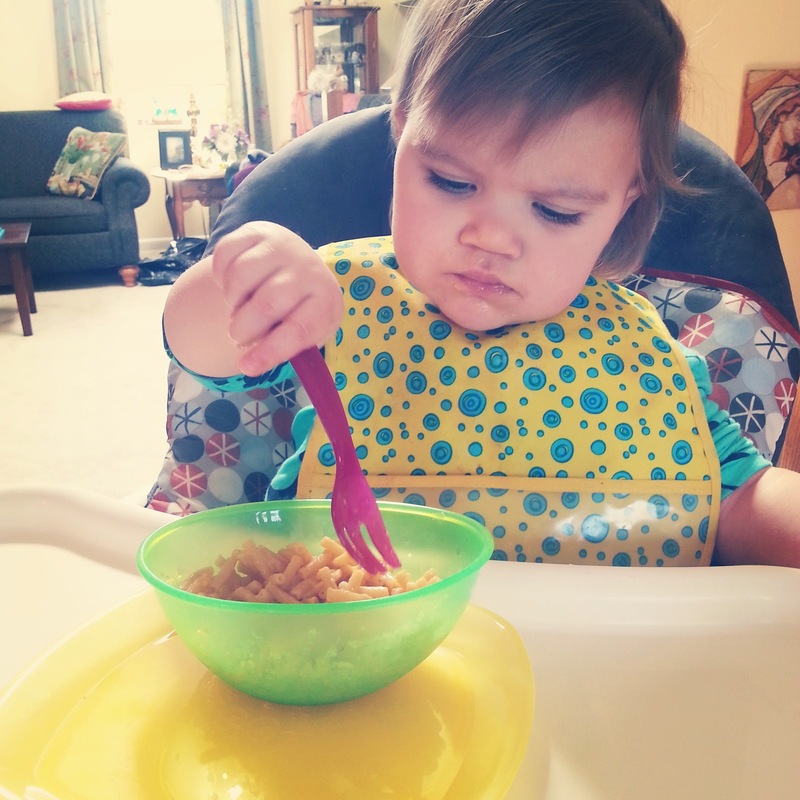 The forks are the perfect size and the prongs can actually pick up food. Joanna still prefers her hands, but its a start. And check out that bowl and plate! I'm also very excited to present Nuby's feeding bowl and rectangular plate. The bowl is genius: it is asymmetrical so one side is slightly higher than the other. It keeps more macaroni and spaghetti inside the bowl by having a higher edge on one side. The plate is equally as genius - it's SQUARE! I know it may not seem like a big deal, but it absolutely is. All of our plates are round, so the spaghetti splatter zone is larger. The square plate doesn't cut the corners (budum ching) so it's less mess. They are also top rack safe, adorable, and durable. So what's better than a giveaway? TWO giveaways! This week you have twice as many chances to win a great product from Nuby! I love the travel case it is so cute! So cute! ANYTHING to keep them entertained and happy when out. I could totally use these! I never realized how the shape of a plate could make that much difference, but I can totally see it!